Build softly, and carry a big stick ... combat is coming! Discussion in 'Update Notes and Developer Discussion' started by Domino, Mar 15, 2016. In the world of Landmark, you can build anything you can imagine, and share your stories with your friends. But what if you want to tell tales of adventure, combat, and dungeon crawling? As part of the coming update, storytelling just got more exciting as we give you the ability to add characters to your claim site, both friends and foes! You'll start with a basic selection of characters and can collect more as you adventure! They can be found in your Props list under "Characters", and are placed just like a prop. Their icons indicate the type of creature, and its weapon and damage types. Characters will behave differently depending on their weapon; expect melee fighters to run up close, while ranged weapon users will keep their distance. The UI will also indicate if a character is tougher than normal. Place characters on your site, customize their names and respawn behaviour, and tell them whether they are your enemies or your allies. Characters that are your allies will actually fight with you against enemies! Set up pathing nodes for your creatures, or tell them to stand guard where they are. Characters can also use interactions to trigger events on their spawn or death - for example, you could set up a door that only opens when the character guarding it is dead. 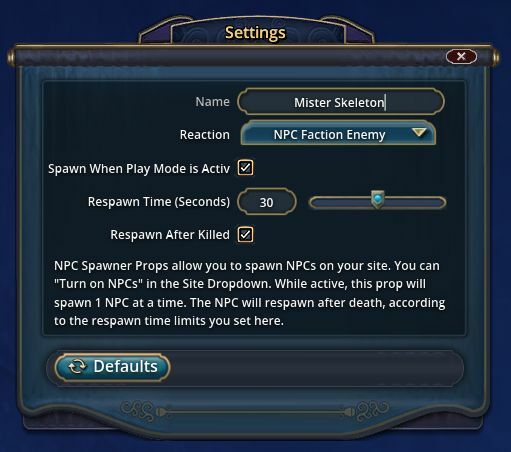 When you enable "Play Mode" on your build site, visitors can experience the adventure you've designed as they travel through your creation, battle the enemies you've set up, and gain treasures from each kill! We're still testing and iterating on these systems, and we look forward to your feedback after the coming beta update. Happy storytelling! * As always, please keep in mind that all images and information above are still works in progress as shown on our internal server; UI and features are not yet final may still change or be removed; look both ways before crossing the street, and please do not feed the chompers. NoahARK, matt3k, FWazzle and 21 others like this. That is looking very nice! There we go. Though this would have been nice to know about before Friday last week. Lili_Birchflower and Tygrion like this. Skeletons!, Ray Guns! I can't wait. I hope these monsters are in the wild also and not just claim dependent. Kurisutaru and Curamach like this. Allastras, twistedsoul, Bomdiggety and 1 other person like this. Sigh...It is far better than nothing, but. 'Spawn when play mode is active' is only a checkbox binary option? No 'Spawn when x L&T piece is triggered'? No 'Spawn after x mob dies'? No 'Spawn upon quest stage x completion'? Is there any chance you would add more flexible options in the future? Nice!!! You got my attention. This is great! Just one question: Is it just mob NPC's? Or will we have passive NPC's as well that are just there to populate an area for ambiance? I'd like to place a barista in my coffee shop (for example). Allastras, Nanny Oggins, Kurisutaru and 2 others like this. Wow, this is more than I was expecting! Thrasymachus, Kiklix, Curamach and 2 others like this. “Sigh...It is far better than nothing, but. Not end the demo, but she did say for example, you could set up a door that only opens when the character guarding it is dead. So i take that there is some L&T. I almost did a tongue wag I was so excited. Almost. Could have been better if we got to select the creature, drop it, right click, then select its load out and abilities, but I understand this is more of a first pass for now. Droopy and Curamach like this. Thank you, I'll have to revisit the game again! Can we set the mobs to drop stuff? So, the player eg. kill a mob and get a key you have to give to another npc to get through a door. Droopy, Kiin Kendov, Sawlstone and 2 others like this. Alright then, I no longer have fears about launch now. I'm eager to see just how much this system expands in the future. Cheers! The excitement is back for Landmark! Looks AWESOME! Finally! The #1 thing on out wish list has been granted. We asked, you listened. Bless you Domino. twistedsoul and Dolgen like this. Daybreak Game Company LLC. and the Daybreak Game Company logo is registered trademarks of Daybreak Game Company LLC.